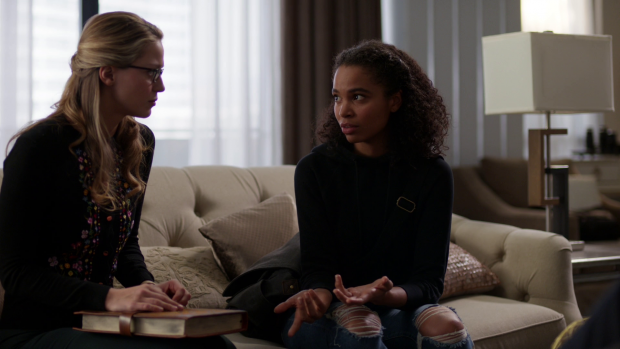 Supergirl continues to explore the tension between Kara and Lena as Coville’s disciples return with a very dangerous plan that could worsen the Reign situation. Kara and Lena’s inability to be on the same page has been an intriguing through line in the recent episodes. It’s a good use of the double identity idea with Lena bearing animosity towards Supergirl while still holding Kara in high regard. At this point we are forced to accept the conceit that Lena -a supposed genius- is unable to tell that she’s dealing with the same person. It’s something I don’t reference that often because the flimsy disguise is part of the Superman mythos that you can either accept or resign yourself to constantly being unable to invest in the world being created. In this case Lena’s inability to figure out that Kara and Supergirl are the same person feels relevant because she is spending a lot of time with both personas even if the time she spends with civilian Kara is off screen. Spending all that time looking at the same face, looking into those same eyes and hearing that same voice should be at least prompting some form of recognition. One possible reason for this not happening is that Lena has some sort of unconscious mental block that prevents her from seeing the truth. At this point she associates Kara with friendship and loving support where Supergirl represents deception and mistrust. Lena can’t see Kara in Supergirl because there’s no way her best friend would treat her that way. It works on some level though it is still a conceit that audiences have to choose to accept. I personally like the idea that Lena sees Kara and Supergirl as two different people because of her perception of the way they treat her. Kara has made a few bad decisions as Supergirl that directly impact Lena’s opinion of her and it’s right that she be called out on them. Asking James to break into Lena’s lab to look for Kryptonite is unquestionably out of line because she puts James in an awkward position where he has to betray the woman he has entered into a relationship with. James does the right thing as far as he’s concerned by coming clean about what he did and it makes his relationship with Lena stronger but it also further erodes Lena’s opinion of Supergirl because it enables her to see Supergirl as someone who uses the people in her life against her. Last week she mentioned that it was something her mother routinely did to her and it’s not something she can tolerate or forgive. As such Lena’s relationship with Supergirl is a purely professional one and she makes that abundantly clear here. Kara is by no means perfect and that makes her more interesting. A running theme through my reviews of late is that flawed characters are more interesting than those written to be “perfect”. Kara makes bad decisions out of fear and doesn’t really consider the implications of them. Whether she wants to admit it or not, going behind Lena’s back to investigate her claims that she has no Kryptonite proves that on some level she doesn’t trust Lena despite claiming that she’s her best friend. This is why she takes a surreptitious approach rather than trusting what Lena has to say. To make matters more complex she is actually right because Lena is lying about having more Kryptonite as well as where she gets it from though arguably it still isn’t Kara’s right to know that. As with many mistakes the motivation behind them is fear. Kara knows that Kryptonite can kill her and doesn’t like the idea that there is some on Earth she doesn’t know about. Lena can make it anytime she wants which understandably puts Kara on edge. This could be a half baked metaphor for gun ownership as the idea that people are carrying around guns makes many feel uneasy, particularly in the current climate though this show doesn’t seem to be prepared to do much with that metaphor. The baseline comparison is understood and adds a bit of relatability to it which strengthens the idea somewhat. Kara may be right in her suspicions but that doesn’t mean Lena has anything to apologise for. There have been many Kryptonians on this show and most of them haven’t held the same values Kara does so Lena coming up with ways to defend against them isn’t only smart, it’s also necessary. For proof we need to look no further than her actions when it comes to dealing with Reign. Her technology, research and intelligence have been instrumental in containing Reign and are currently the only hope they have to restore Sam. This episode emphasises Kara’s difficulty resolving the two sides of her where Lena is concerned. Lena still sees Kara as her best friend but doesn’t trust Supergirl which puts Kara in a difficult position since she has chosen to lie to Lena from the day they met. Currently Lena is the only one who doesn’t know Kara’s secret identity and that’s through choice on Kara’s point. Now she’s faced with the prospect of Lena hating her if she ever finds out the truth. Kara wrestles with this idea because she has no idea how to move forward. Mon’El’s advice is to go to Lena as Supergirl and try to make her understand the reasons behind her actions. It doesn’t make the situation any better or worse but it does let Kara know where she stands as Supergirl. Attempts to convince Lena to restore their friendship fall on deaf ears because Lena’s life experiences have taught her to write off people who treat her the way Kara has treated her. She also doesn’t understand Kara’s obsession with being Lena’s friend and makes it very clear that they will never have anything more than a professional connection. Kara is forced to accept this because continued probing would put her identity at risk. Kara has a significant issue because the personas are in conflict as far as Lena’s concerned. The only way to preserve that friendship with Lena is to continue lying to her but it must be in the back of her mind that Lena will eventually learn the truth. Unfortunately the show doesn’t do enough with this idea because we don’t see much of Kara in her civilian identity. She doesn’t share any scenes with Lena as Kara in this episode so no attempt has been made to explore how their friendship is affected by Kara knowing how little Lena thinks of Supergirl. 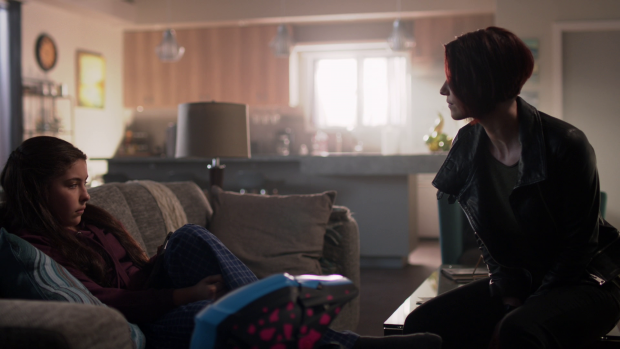 This is an angle worth digging into because this is an important obstacle to their friendship that is caused by Kara’s Supergirl role. This is especially true now that Kara is starting to understand what mistakes she has made so being around Lena while dealing with the associated guilt is very much a goldmine of content for both characters and actors. 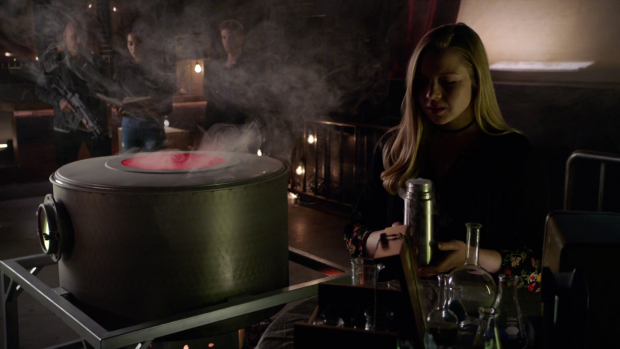 The plot of the episode involves the return of Coville’s religious group with the focus on Olivia’s (Sofia Vassileva) attempt to create a new Worldkiller. 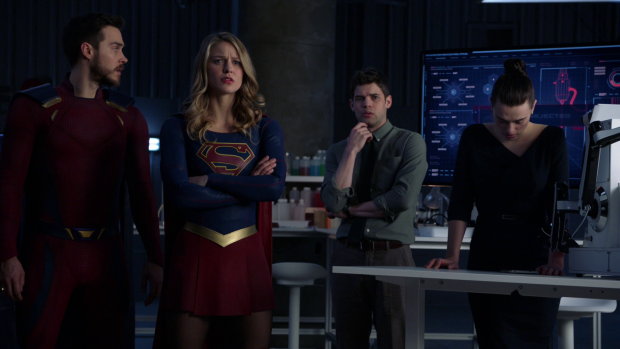 When the religious group were introduced they were a really compelling addition to the show in general because the act of worshipping Supergirl as a God who protects people isn’t a bad thing by definition. Kara may not be comfortable with it but she has no right to tell people how to do it. It lost a lot of traction by having the group become another villain of the week and that seems to be what they have been relegated to in this episode as well. Olivia’s desire to make a new Worldkiller doesn’t feel as profound as it should and it basically amounts to a threat that builds in the background in order to inform the other stories going on in some way. It’s not terrible but it’s very underwhelming and lacks the stakes that it should have. Olivia is a problematic character who never feels fully developed so isn’t interesting. Her change of heart after Kara apparently inspires her to think differently feels unearned because there’s no baseline for her having doubts. This could have been a really strong story exploring the potential pitfalls of letting blind devotion to a cause colour judgement but it was a fairly standard supervillain origin/defeat story. Some depth is accomplished through the use of Tanya (Nesta Cooper) who flees the group when she becomes uncomfortable with their values and what they decide to do. Her insight into the group as well as the reasons people might join are invaluable in terms of establishing them as something people might respond to and want to be a part of. She talks about it being positive when she joined and a good reason to bring like minded people together. Basically she gravitated to the group because they shared her values at that time and gave her something to belong to. That’s not a bad thing and it’s certainly understandable why someone who feels otherwise isolated might find a home with these people. She is also shown to be someone who has limits and wanted away from it once she realised what was really going on. The idea that they won’t let her adds a sinister edge to them which is good for Tanya being a part of something she didn’t fully understand but does very little for the group who now seem like a shallow cult. James takes it upon himself to protect Tanya which brings us one of the only Guardian appearances this season. His attempt to rescue Tanya is successful but results in Olivia and those who follow her to learn that James is Guardian. She wastes no time using this as leverage to get Tanya back by giving James the choice of returning her or have his identity revealed to the public. This acts as a companion to Kara’s identity crisis while actually adding a valid reason for James specifically wanting to be a costumed vigilante. I repeatedly mentioned that James’ motivations made no sense last season because it came across that he became Guardian because all of his friends are heroes in some way and he felt left out. It was a flimsy justification that made no real sense and added nothing worthwhile to his character. This episode brings something of a retcon to this motivation but it’s definitely a welcome one. One thing I didn’t expect was that James’ desire to he a Hero was racially motivated. He opens up to Lena about the first time he was put in handcuffs at the age of 7 and how that experience stuck with him because it highlights race inequality in a really big way. To many black people are criminals even after they are proven innocent so James decides to hide behind a mask to allow people to respect him as a Hero without considering the colour of his skin. It’s a well written and well acted moment that answers my lingering question around why James doesn’t simply join the DEO if he wants to help Supergirl fight the good fight. He doesn’t do that because he doesn’t want to be a face in the crowd working for a covert organisation. Instead he wants to give people something to look up to that transcends race. His monologue detailing his mistreatment at the hands of police officers at such a young age highlights a number of issues that James is struggling with. He feels that the world he lives in is stacked against black people hence his desire for true anonymity as Guardian and he also fears a lack of acceptance as a black superhero in the modern climate. Lena is there to offer words of encouragement and tells him he shouldn’t have to worry about that level of persecution but James points out that it happens whether she thinks it should or not. The reality of the situation is far different to the ideal scenario and having James as the mouthpiece for that discussion adds weight to it. By the end of the episode he feels more optimistic about one day revealing his identity to the public to give others hope but it’s clear that he isn’t there yet and is at an early stage of the journey that will eventually take him there. J’Onn and Alex’s arcs match up because they are both dealing with people who have become withdrawn due to recent circumstances. M’Yrnn and Ruby have very different problems but they are both retreating inward and basically refusing to interact with the outside world. Their early conversation talking about the similarities as well as the differences is really well done and adds more to the familial connection that exists between them. M’Yrnn’s illness means that he has good days and bad days with the good becoming far more infrequent. 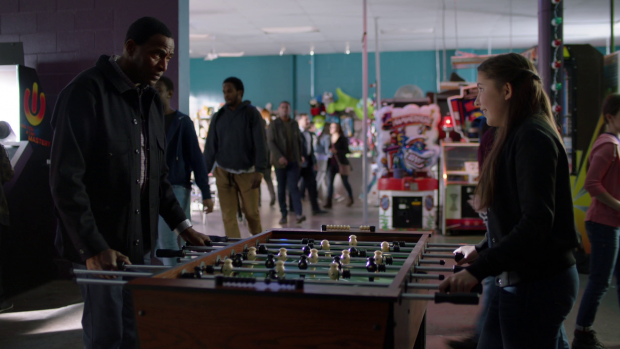 J’Onn speculates that playing video games might help keep his father’s mind sharp so a trip to the arcade is in order with Ruby also in tow. It’s a distressing experience for M”Yrnn at first because the loud simulated gunshots remind him of being at War and he becomes very confused. Ruby simply doesn’t want to be there so she also has issues to deal with. This culminates in M’Yrnn and Ruby finding some shared comfort as they bond over Foosball tand take a step forward in terms of accepting the help of others and reducing their own frustrations. It’s an endearing moment that makes good use of two engaging supporting characters tgat have been brought into this season. Alex continues to demonstrate that she has a long way to go before she’s ready for parenthood. She does the right thing by trying to engage Ruby and bring her out of her funk but she goes about it in the wrong way by being a bit too forceful in her approach. Ruby does need a push to encourage her to accept the help of others but she also needs time and Alex doesn’t quite realise that. 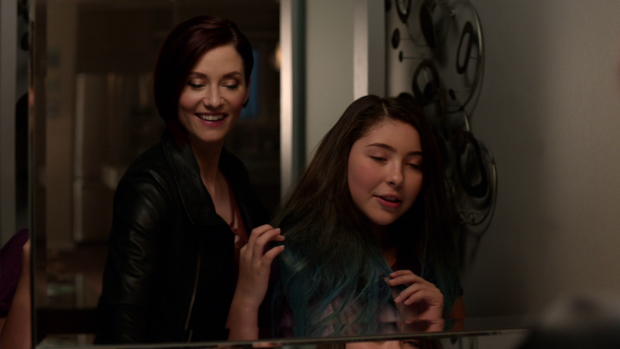 I really like the Alex/Ruby dynamic and how that continues to evolve with Alex learning lessons about her own developing parental skills. One thing that definitely isn’t working is Mon’El and him dealing with his feeoings for Kara. Imra gave him permission to stay in the past and resolve his conflicted feelings but this has already transitioned to Mon’El being eager to tell Kara how he feels. His conversation with J’Onn establishes that telling Kara how he feels would be a selfish gesture but this won’t be the last of it. It’s really uninteresting and the tension between them will likely fill up the bulk of the next episode with them taking an interstellar road trip together. A strong episode that heightens the tension between Kara and Lena while providing a better motivation for James to be Guardian. As with previous episodes the beauty of the Kara/Lena dynamic at this point is how complex it is. Lena treats her current partnership with Supergirl as a professional arrangement which upsets Kara who sees her as a friend. This episode has Kara acknowledge the mistakes she made while dealing with the fact that Lena might never consider Supergirl a friend. It’s unfortunate we don’t see any scenes of Kara in her civilian identity trying to interact with Lena knowing that telling the truth about who she is might come at the expense of their friendship. It’s a great conflict because Kara is flawed and Lena’s side is entirely justified. The retconning of James’ motivation for becoming Guardian to the creation of a hero that everyone could look up to without the colour of his skin being a factor is a lot better than we had before. His well written and acted monologue highlights the issues that are faced by black people in the world and his desire to find a way to improve that. Ultimately deciding that he isn’t ready to publicly unmask yet but will be someday is really strong and optimistic. The threat of the week sadly misuses Coville’s religious group by turning them into another mediocre threat. Olivia’s desire to create a new Worldkiller doesn’t add much more than a temporary inconvenience so the concept on the whole is wasted due to lack of time spent on it. Tanya’s presence adds some depth but only really from her perspective by establishing that the group did have something that people saw worthwhile. Ruby and M’Yrnn’s withdrawn natures bring together J’Onn and Alex’s arcs in really interesting way. J’Onn has to learn how to handle his father’s deteriorating condition and Alex is learning hard lessons about being a parent. Ruby and M’Yrnn make for an endearing pairing that works well and seeing them take steps forward from their own isolation worked really well. Mon’El’s current stance on his feelings for Kara is really uninteresting and sets up the next episode to be defined by angst and tension as they take an interstellar road trip together.